Creating financial projections for your startup is both an art and a science. Although investors want to see cold, hard numbers, it can be difficult to predict your financial performance three years down the road, especially if you are still raising seed money. Regardless, short- and medium-term financial projections are a required part of your business plan if you want serious attention from investors. The financial section of your business plan should include a sales forecast, expenses budget, cash flow statement, balance sheet, and a profit and loss statement. Be sure to follow the generally accepted accounting principles (GAAP) set forth by the Financial Accounting Standards Board, a private-sector organization responsible for setting financial accounting and reporting standards in the U.S. If financial reporting is new territory for you, have an accountant review your projections. As a startup business, you do not have past results to review, which can make forecasting sales difficult. It can be done, though, if you have a good understanding of the market you are entering and industry trends as a whole. In fact, sales forecasts based on a solid understanding of industry and market trends will show potential investors that you've done your homework and your forecast is more than just guesswork. In practical terms, your forecast should be broken down by monthly sales with entries showing which units are being sold, their price points, and how many you expect to sell. When getting into the second year of your business plan and beyond, it's acceptable to reduce the forecast to quarterly sales. In fact, that's the case for most items in your business plan. What you're selling has to cost something, and this budget is where you need to show your expenses. These include the cost to your business of the units being sold in addition to overhead. It's a good idea to break down your expenses by fixed costs and variable costs. For example, certain expenses will be the same or close to the same every month, including rent, insurance, and others. Some costs likely will vary month by month such as advertising or seasonal sales help. As with your sales forecast, cash flow statements for a startup require doing some homework since you do not have historical data to use as a reference. This statement, in short, breaks down how much cash is coming into your business on a monthly basis vs. how much is going out. By using your sales forecasts and your expenses budget, you can estimate your cash flow intelligently. Keep in mind that revenue often will trail sales, depending on the type of business you are operating. For example, if you have contracts with clients, they may not be paying for items they purchase until the month following delivery. Some clients may carry balances 60 or 90 days beyond delivery. You need to account for this lag when calculating exactly when you expect to see your revenue. Your P&L statement should take the information from your sales projections, expenses budget, and cash flow statement to project how much you expect in profits or losses through the three years included in your business plan. You should have a figure for each individual year as well as a figure for the full three-year period. You provide a breakdown of all of your assets and liabilities in the balances sheet. Many of these assets and liabilities are items that go beyond monthly sales and expenses. For example, any property, equipment, or unsold inventory you own is an asset with a value that can be assigned to it. The same goes for outstanding invoices owed to you that have not been paid. Even though you don't have the cash in hand, you can count those invoices as assets. The amount you owe on a business loan or the amount you owe others on invoices you've not paid would count as liabilities. The balance is the difference between the value of everything you own vs. the value of everything you owe. If you've done a good job projecting your sales and expenses and inputting the numbers into a spreadsheet, you should be able to identify a date when your business breaks even—in other words, the date when you become profitable, with more money coming in than going out. As a startup business, this is not expected to happen overnight, but potential investors want to see that you have a date in mind and that you can support that projection with the numbers you've supplied in the financial section of your business plan. Get comfortable with spreadsheet software if you aren't already. It is the starting point for all financial projections and offers flexibility, allowing you to quickly change assumptions or weigh alternative scenarios. 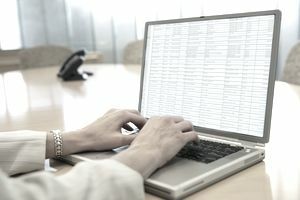 Microsoft Excel is the most common, and chances are you already have it on your computer. You can also buy special software packages to help with financial projections. Prepare a five-year projection. Don’t include this one in the business plan, since the further into the future you project, the harder it is to predict. However, have the projection available in case an investor asks for it. Offer two scenarios only. Investors will want to see a best-case and worst-case scenario, but don’t inundate your business plan with myriad medium-case scenarios. They likely will just cause confusion. Be reasonable and clear. As mentioned before, financial forecasting is as much art as science. You’ll have to assume certain things, such as your revenue growth, how your raw material and administrative costs will grow, and how effective you’ll be at collecting on accounts receivable. It’s best to be realistic in your projections as you try to recruit investors. If your industry is going through a contraction period and you’re projecting revenue growth of 20 percent a month, expect investors to see red flags.